“You don’t know what I’ve been through,” said the 78-year-old woman as she pleaded with the telemarketer who called, pressing her to send $500, then as little as $100, to allegedly make her eligible for a $50,000 cashier’s check. Having already spent much of her life savings to telemarketing swindlers, the elderly woman resisted, then began sobbing as the scoundrel turned up the pressure. Finally, he gave up in disgust. “You’re going to your grave a loser,” he snarled. That conversation was recorded as part of an undercover investigation into telemarketing crime aimed primarily at elderly victims. In conducting the investigation, retired law enforcement agents and specially trained volunteers posed as “hot prospects,” a synonym for possible victims in the vocabulary of telemarketing scam artists. Telephone scamsters often buy and sell lists of people considered easy marks for fraud. Many of those targeted have been victimized before. Others may have answered ads or phony charity solicitations. Some victims reported receiving five or more calls a day from high-pressure telephone salespeople. Seniors are frequent targets of telephone scams because they’re home during the day and are too polite to hang up. A recent telemarketing scam out of Jamaica involved telemarketers telling victims they had won the lottery; however, before any money could be released, the victims were asked to send a percentage of the amount supposedly won to pay the so-called taxes on the winnings. If that’s not bad enough, some telemarketing victims are taken a second time by another con-man who calls back and identifies himself as a business that helps people recover money after being scammed. The victims are then asked to send more money to help recover the lost money. Of course, no money is ever received. • A real prize requires no up-front money, whether it’s for shipping, handling, taxes or the purchase of a product. Legitimate sweepstakes contests and prize promotions do not require a purchase or payment. If you have to pay for it, then it’s not free. A red flag for fraud is when the telemarketer expects you to pay for a prize before you receive it. • Be very suspicious if someone says they’re from a government agency and is asking for money. If the individual who’s requesting money claims to be from a government agency, then ask for a certified letter on official agency letterhead. If they annoy you, simply hang up. • Never give out your credit card number, bank account numbers or your Social Security number over the phone to a stranger who promises you money in exchange. For additional consumer protection information, visit the the Better Business Bureau online at www.bbb.org or call the BBB’s 24-hour consumer helpline at 1-800-600-7050 to obtain free information on local companies and accredited businesses in a particular type of industry. 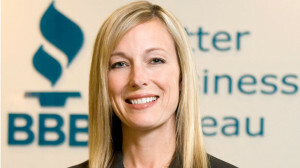 Sheryl Reichert is president and CEO of the Better Business Bureau of San Diego and Imperial Counties.